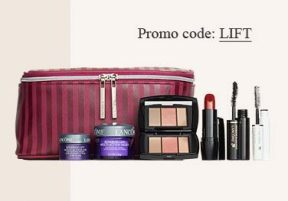 Lancome gift with purchase offers are usually happening 2 times per year at U.S. department stores such as Macy’s, Dillard’s, Lord & Taylor and Nordstrom. However, there might be many ‘back-in-stock’ offers anytime during the year. Note that the minimum purchase limit is higher (usually above $35.50 instead of $29 for Clinique bonuses), but the gifts have a higher value, too. 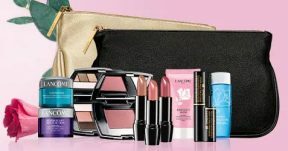 Starting from April 4, 2019 – while supplies last personalize your 7-piece Lancome gift direct from Lancome.com website. Yours with any $60+ purchase. Valued at up to $116. 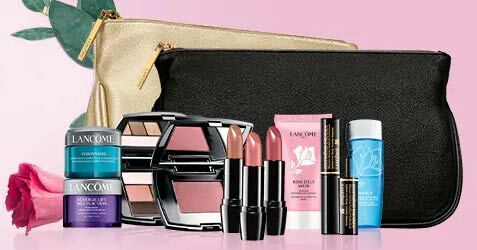 Spend $75+ on Lancome and receive your choice of 3 additional beauty essentials. Total gift worth up to $168. Get 15% off your beauty purchase when you enter promo code FRIENDS (expires 4/20) at L&T checkout page. Free shipping with any $49+ beauty purchase. While supplies last. 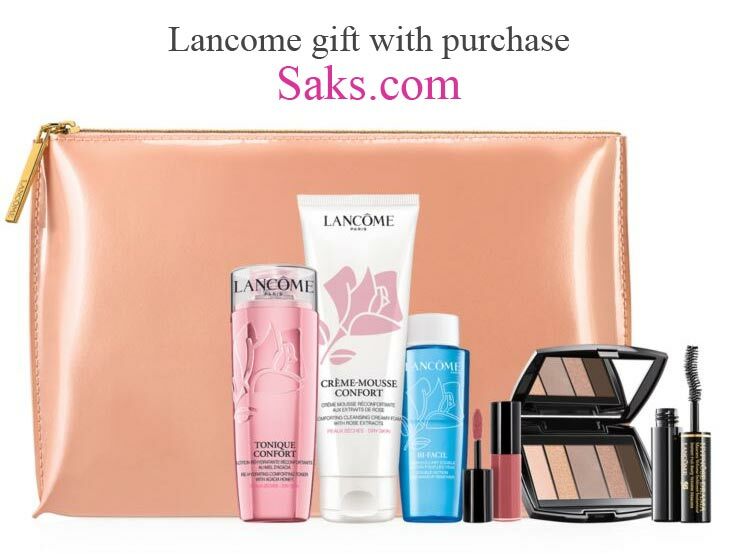 While supplies last – choose your free 7-piece Lancome gift online at Nordstrom and in U.S. stores (in-store offer may vary) when you spend $39.50+ on Lancome. Gift valued at up to $142. Promo code required. 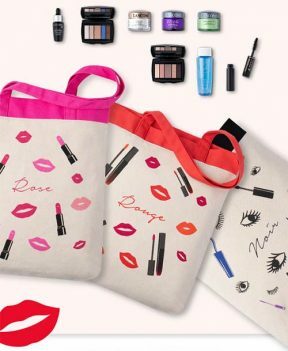 Spend $75 or more on Lancome and also receive a three-piece bonus gift (Cils Booster XL Vitamin-Infused Mascara Primer (0.07 oz. ), Prep & Matte Primer (0.34 oz.) and Monsieur Big Mascara (0.07 oz.). A $176 combined value. Spend $99 or more on Lancome and you will also receive a Color Design Eyeshadow & Blush Subtil Palette in Classic Day (0.18 oz.). Online only. You will also receive free shipping and you can also choose three free packette samples at checkout. 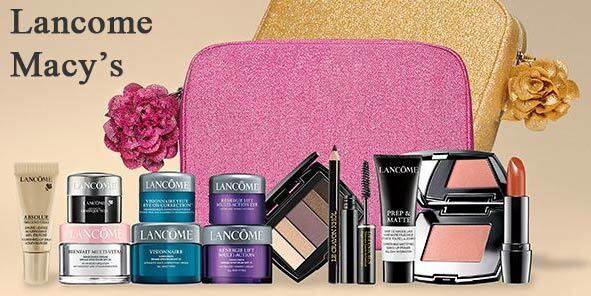 Don’t forget to enter one of the promo codes – either PINK or GREY at checkout to add your 7-piece Lancome gift. All the gifts are available while supplies last. 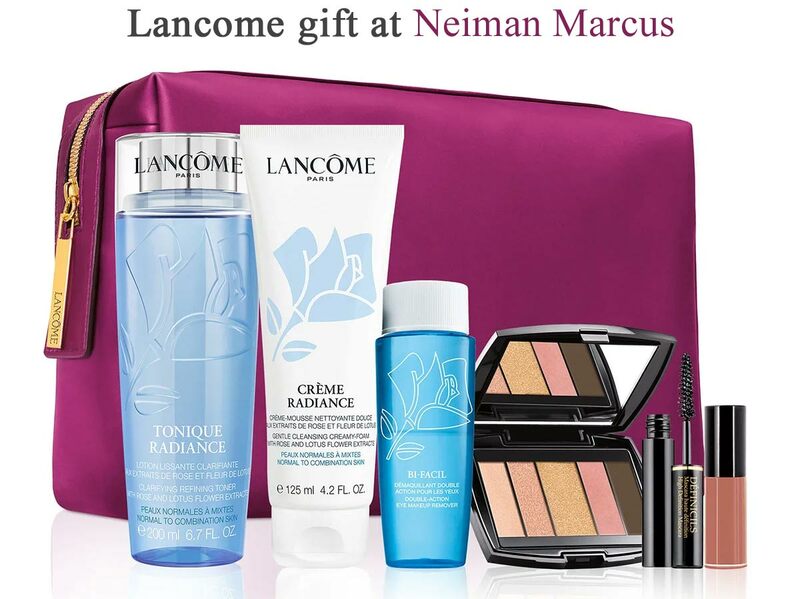 There is a Spring Beauty Event including this Lancome GWP at Belk online and in-stores. Worth up to $130. Yours free with any $37.50+ Lancome purchase. Note that in-store offer may vary. 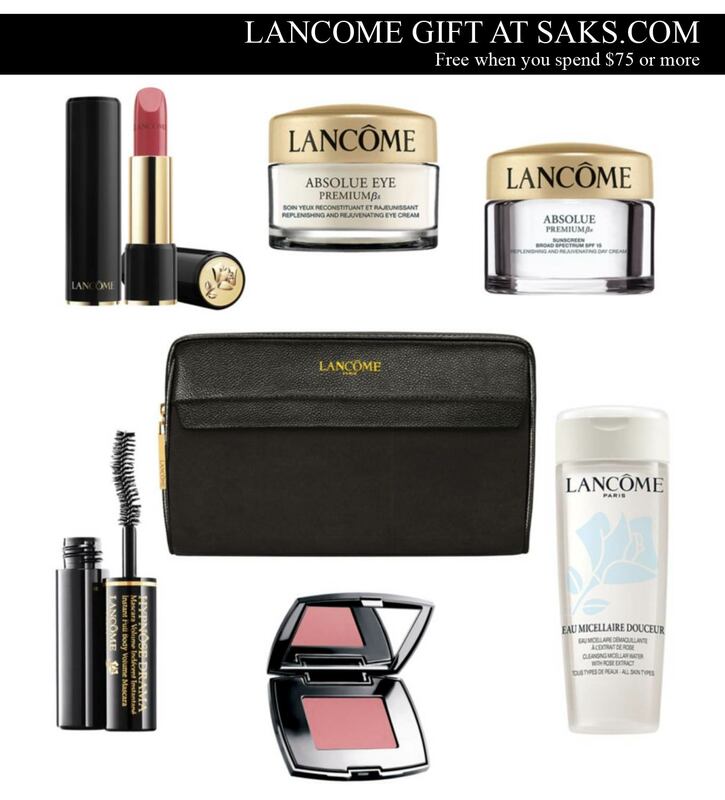 Spend $75 on Lancome and choose an additional 3-piece gift! Worth up to $190. You can also enter coupon code BEAUTYSAVINGS at checkout and get $15 off $75 makeup, skin care, fragrance and bath & body purchases. Ends Sunday, 3/24 at 11:59pm ET. You will also get free shipping. Only one GWP per client. Lancome GWP at Von Maur. With any $39.50 Lancome purchase you can choose one of two 7-piece gifts. Offer may vary in stores. While supplies last. You will also receive free shipping. 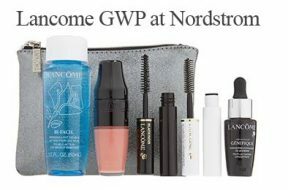 There is a Lancome GWP at Bloomingdale’s online and in stores (the offer may vary in-store). To qualify you have to make a Lancome purchase of $39.50 or more. Step up gift: Spend $75 or more and also get a makeup trio or your choice of skin care trio. The offer ends March 17, 2019 or while supplies last. Note: Bloomingdale’s offers free shipping for loyalists (it’s free to register) or if you don’t want to register just spend $50 or more & receive free shipping. 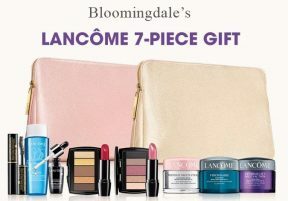 There is a Lancome GWP at Saksfifthavenue.com – spend $125 or more on Lancome products and receive this complimentary seven-piece gift. To receive the gift you have to enter promo code LANCME6SF at checkout. You can also enter code FREESHIP to get free shipping. Offer valid at Saks.com through Sunday, March 3, 2019 at 11:59pm (ET) or while supplies last. The Beauty Event at Neiman Marcus is now going on. There are many beauty gifts available, including this Lancome gift. Free with your $125+ Lancome purchase. The gift will be automatically added in your shopping bag when the value of your Lancôme order is $125 or more. 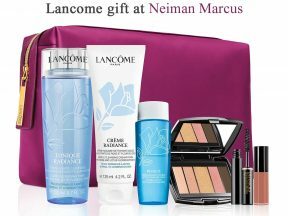 Starting from February 5, 2019 – while supplies last, receive these Lancome gifts at Macy’s. You will also receive free shipping (with any $49+ beauty purchase). Free shipping and you can also choose three free packette samples at checkout. No promo code needed. Gift will be added automatically in Checkout. 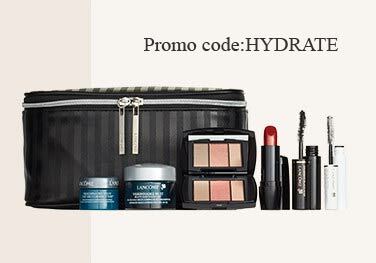 Spend $49+ and receive this 5-piece gift direct from Lancome. You will also get 20% off and 2-day shipping. Enter code THANKYOU at checkout. Offer ends on December 21, 2018 or while supplies last. Lancome GWP at Macy’s; with any $50 Lancome purchase receive this 6-pc gift. Online only. The gift(s) should be added automatically at checkout, if not, it is out of stock. Spend $39.50 on Lancome products at Lord & Taylor and customize your free exclusive LANCÔME 7-piece gift (up to a $105 value). You can choose the options at checkout and you will also receive free shipping. A special Black Friday and Cyber Monday offer at Nordstrom. Online only from November 21, 2018 – while supplies last. No promo code needed, the gift will be added automatically at checkout. Update: there is currently a new Lancome gift – with any $100 purchase. Enter code LANCME33. 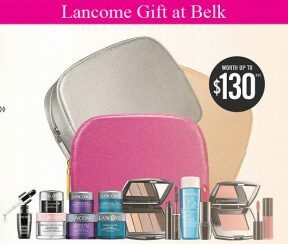 There is a Lancome GWP at Saksfifthavenue.com online and instores – yours free with any $75+ Lancome purchase. You can choose from 2 gift sets. Enter promo code LANCME8A or LANCME8B in order to receive the gift. 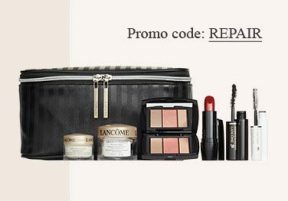 Plus, if you spend $100 or more on Lancome you can also enter promo code LANCME9A or LANCME9B to also receive three bonus minis at checkout. You can also receive free shipping when you enter code FREESHIP. Online only. Offer valid now through November 11, 2018 at 11:59pm. 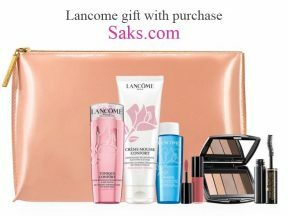 Starting from September 17, 2018 there is a new Lancome gift offer at Nordstrom. Choose one from three seven-piece gifts – free with your $39.50 Lancôme purchase. Up to $140 value. Advanced Génifique Serum (0.27 oz.). Up to $184 combined value. A promo code is required for the base (7-piece) gift to be entered at checkout, but these extra gifts should be added into your shopping cart automatically, without entering a promo code. You will also get free shipping. Quantities are limited. Note in-store offer may vary. 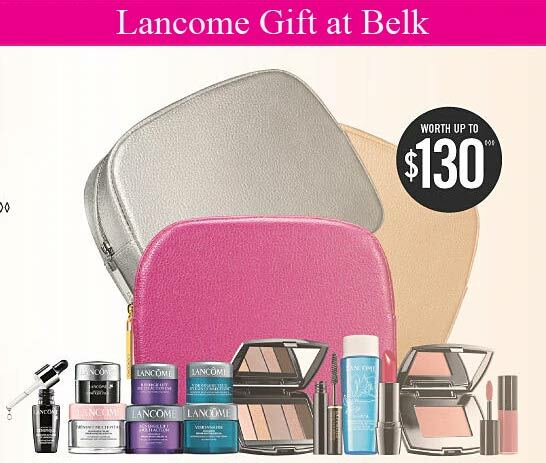 A free 7-piece Lancome gift with any $37.50 Lancome purchase at Belk (online and in-stores). Gift valued at up to $130. Extra gifts: spend $75 or more and and also choose a bonus makeup or skincare trio, while supplies last. Limited quantities available. You will also receive free standard shipping with no minimum purchase. 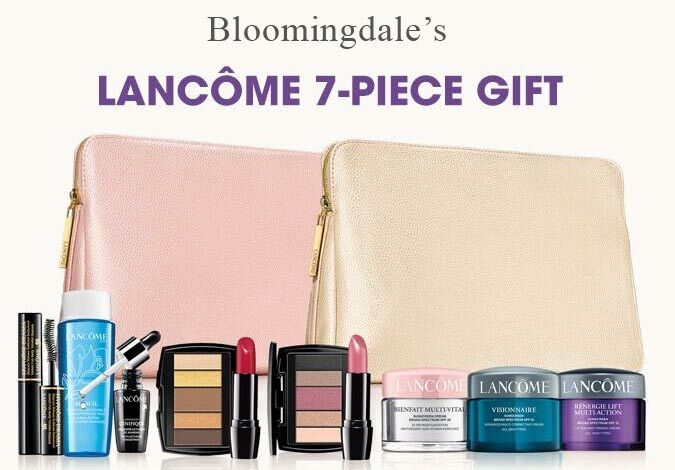 There is a 6-piece Lancome gift at Dillard’s – yours FREE with any $35+ Lancome purchase. The gift value: up to $118. Spend more – $70 and choose your skincare or makeup trio. Note: At Dillards shipping is $8.50. Free for Dillard’s cardholders. There is Lancôme GWP at Dillard’s now (online & instores). Yours free with any $35.00 Lancome purchase. You will receive a 7-piece gift, valued at up to $128. Value will vary based on client’s selection of products. You can choose your day moisturizer, blush and lip color duo and cosmetic bag. You will also receive Monsieur Big Mascara, Absolue Precious Cells Nourishing Lip Balm, Bi-Facil Face Bi-phased Micellar Water & Cleanser. At Dillard’s only: upgrade your gift when you spend $70 or more and choose another free gift: skincare or makeup trio. While supplies last. Expiration date is not specified. *Shipping is free on beauty orders over $49 at Boscov’s and at Dillard’s shipping is always $8.50. There is a great complimentary Lancome gift at Saks 5th Avenue now through November 11, 2017 or while supplies last. An AB BX Day & Eye Cream, full-size L’Absolue Rouge Lipcolor, Hypnose Drama, Blush Subtil, Eau Micellaire Douceur, and Hypnose Drama all included in a Black Cosmetic case. You must enter code LANCME5 at checkout. Note: Gift will not be added automatically into your shopping bag. You need to enter one of the promo codes mentioned above. LANCME6 – 3 bonus skin care minis (Genifique, Absolue BX Night, and Hand Cream samples). Valid only for orders over $100. These codes can be entered at checkout (after clicking “Saks bag” or “View my bag”). Saks.com allows entering up to 5 promo codes per order. The offer ends on November 11, or while supplies last. Lancome.com has a gift with purchase that is going to start tomorrow. Up to 10 free minis (our choice!) with purchase. Yesterday 12/3 I purchased in-store the Lancôme 9-piece set of lip glosses ($40) and a $30 concealer. I asked about the promo gift if you spend $45 on Lancôme products (the small black ouch and assorted products) and was abruptly told it was only a 2-day sale 12/1+ 2 and that they were out of stock. It was never advertised as a 2 day event nor that supplies were limited. I’m thinking of returning the lip glosses (I already used the concealer so I can’t return the whole purchase) since this was clearly a case of false advertising. I thought Lancôme was better than that. I’ve been purchasing Lancome products for over 30 years but now I will be looking to find another line of cosmetics. How disappointing. 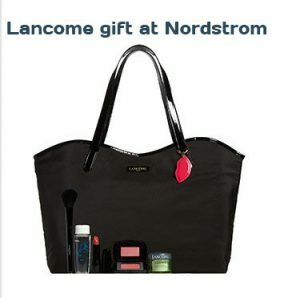 is the $35 purchase for the Lancome gift on now at the La Jolla Village Macy’s? When will Macy’s and Nordstrom have their next gift with purchase sale? I am a new customer my name is ollie jefferson and I saw in the newspaper where I could get free gifts with $35.00 or more of lancome purchase and if I spent more I could get chose 7 more free items well I want you to know that I am disappointed, when I went in the southaven store on 4/29/15 I spoke with Erica at the lancome counter and I bought $180.83 worth of lancome products and I ask her was the free gifts still available she said yes, then she preceeded to put absolute night cream, hydra fraichelle, advance genifique (i didn’t need I just purchased a big bottle of that) definicials, make up remover, I always buy lancome products so I have more than enough make up remover and then she threw in two sample packs of renergie mulit-action in my bag. When she handed me the bag I asked her what was in the bag and she told me that these were my free gifts, then I said to her the newspaper ad said that I could choose my products, how did she know which products that I wanted and then she told me something that I could have taken the wrong way she told me she looked at my age and she FELT like she gave me what I needed. I realize that I am a 66 year old woman but unless someone is PAYING for what I am getting they have NO, NO, NO right to tell me what I need. I told her that that was not right and really I was in a very big RUSH because if I had not being a RUSH I would have given that YOUNG LADY a crash course in ,”How to be polite to someone who is paying your salary 101.” I might be wrong but from how I read the newspaper article I could CHOOSE three gifts with $35.00 or more of lancome purchase and if I spend another $70.00 or more I could get to CHOOSE 7 more gifts. If I read it wrong and 5 items was all i was suppose to receive I apologize but I will not apologize for ERICA’S insensitivity. I can be reached by phone at 901-332-2859. After I pay this purchase off I will close my card because I will not shop in a store with insensitive clerks. What stores are currently offering free gifts or gifts with purchase or purchase wit purchase.